SMARTBOX is your go-to source for all your moving and storage services in the Maryland, Northern Virginia, and Washington, DC area. We offer an innovative solution to moving and storing your belongings that can help make getting from point A to point B so much easier. How can we do that, you ask? Continue reading to find out! Are you interested in moving and storage services in MD, VA, or DC? 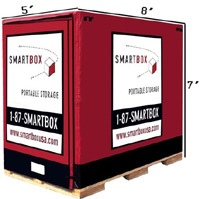 Call SMARTBOX today-our number is 301-683-6111! SMARTBOX makes moving and storage simple. We offer separate moving and storage services, as needed, or they can be seamlessly combined to create something that works for you. We do this through the use of portable storage containers. We’ll bring our storage containers to you-we can drop them off nearly anywhere that’s convenient-and you can take all the time you need packing them. There will never be any rush to get everything done in one day or pack and unpack the car. What makes this system really useful is that once your containers are on site, they can be used for moving and storage. All you have to do is assign certain boxes for moving and certain boxes for storage, and let the SMARTBOX crew know which is which upon pick up. We can then take the storage-designated containers to our secure, temperature-controlled storage facility for safe-keeping and take all your boxes for moving to your new home or office. SMARTBOX always uses upfront pricing and accurate quotes-you’ll never be hit with hidden fees or charges. In fact, you can even figure out approximately how many storage containers you’ll need with our online space estimator. At SMARTBOX, it’s our job to make moving and storing your belongings easier than ever. In addition to our moving and storing services, we also offer moving supplies and packing services (including loading and unloading). We’re your one-stop-shop for all things relocation and storage.